David DuBose received his BFA from Texas Tech University in 1986 and his MFA from Louisiana State University in 1990. He has had artist residencies in Ireland, Canada, Germany and the United States. He lived in Northern Ireland for thirteen years, where he taught printmaking at the University of Ulster in Belfast and was a visiting artist or lecturer at a number of other schools and colleges throughout Ireland. 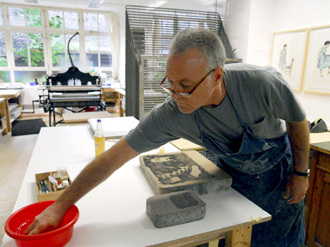 He regularly taught printmaking courses at Belfast Print Workshop and Seacourt Print Workshop, and was the Director of Seacourt Print Workshop for seven years until returning to the United States in 2005. He is currently Assistant Professor of Drawing and Foundations at the University of Louisiana at Lafayette.